Me (and my computer) are overwhelmed with pictures at the moment. Three different countries, nine different cities, 600+ pictures....I don't even know where to start. I think it's best to start simple, and begin with Day One of our adventures: Frankfurt. We didn't spend much time in Frankfurt, only a few hours after Britney arrived, but we had a great time wandering through the streets and along the Main River. Frankfurt is, by far, the most modern German city I have seen in my (limited) travels around this country. 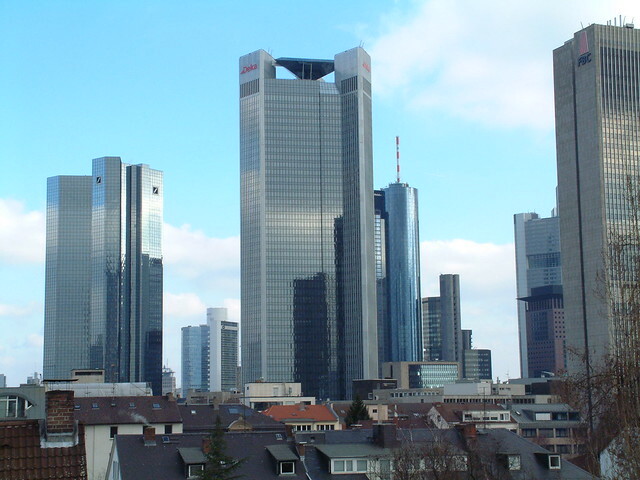 A major financial district, it is one of the few cities in Germany that you will find sky scrapers. And while I like that most cities in Germany restrict the height of new buildings in order to preserve the look and feel of the romantic architecture that we all so closely associate with Europe, I like the balance that Frankfurt has struck between the old and the new. I love that, even amidst all the modern, you can still enjoy the beautiful architecture of the centuries past. There seems to be this perfect balance between the two, a balance that can't be easy to achieve. One of our favorite Frankfurt finds was the Kleinmarkthalle, an indoor market located downtown. Literally translated "Little Market Hall" this place had all the offerings of a typical market (meats, cheeses, fresh fruits and veggies, breads, spices) with the addition of a little more diversity. Which, actually, I can find periodically at my local grocery store, so I guess that's not so different. But, they do have something that I have only seen once in my two years in Germany. My recipe choices just expanded exponentially. One cool thing about this being an indoor market: there's chocolate. And of course, no trip would be complete without food. Oh wait, I just showed you a bunch of food, so let me rephrase that: No trip would be complete without eating food. We enjoyed a delicious breakfast--scrambled eggs with basil with a whole grain roll, oh so good--at a cute little cafe, Cafe Karin, located in the heart of the city. The food was great, the location was perfect, the service was friendly, and the prices were reasonable. I highly recommend checking this out next time you're wondering through Frankfurt. And that concludes our short visit to Frankfurt. Next up: Heidelberg. Or maybe a Recipe of the Week. Or maybe a German cultural experience. Cause I definitely have all three of those in the works, among other things. Stay tuned and have an awesome day!